I directed Hamlet for Pittsburgh Classic Players in October of 2013. The show ran for three weekends in November of 2013 at The New Bohemian, a former Czech Catholic church, currently in use as a tattoo parlor, art gallery, and a general space for creative expression. The rich tones of the peeling paint reflected my vision of Elsinore, a bright place falling apart as internal intrigue and foreign entanglements tear the nation asunder. I drew on two points of inspiration for the world of Hamlet: the Lower East Side of New York City in the 1970s and Nixon's inauguration. I turned to the 1970s because it was a tumultuous and transitional time, because the kind of despair that permeates when the great leaders are dead and the dreamers seem to be just that seemed apt for Hamlet. It's a play where love breaks everyone's heart. Throughout the production I held onto the idea that neither poets nor politicians can save Denmark. For me, Hamlet is a story of competing allegiances, of love and despair. The Hamlet I directed for Pittsburgh Classic Players delivered an intimate and immediate version of Shakespeare's classic with eight actors portraying twenty-five characters. 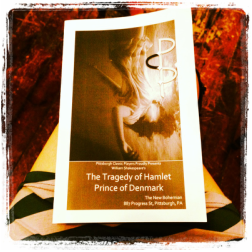 It was an honor, a pleasure, and a privilege to direct the inaugural production of Hamlet. You can read more about my journey with the play on my blog and about Pittsburgh Classic Players on their website.